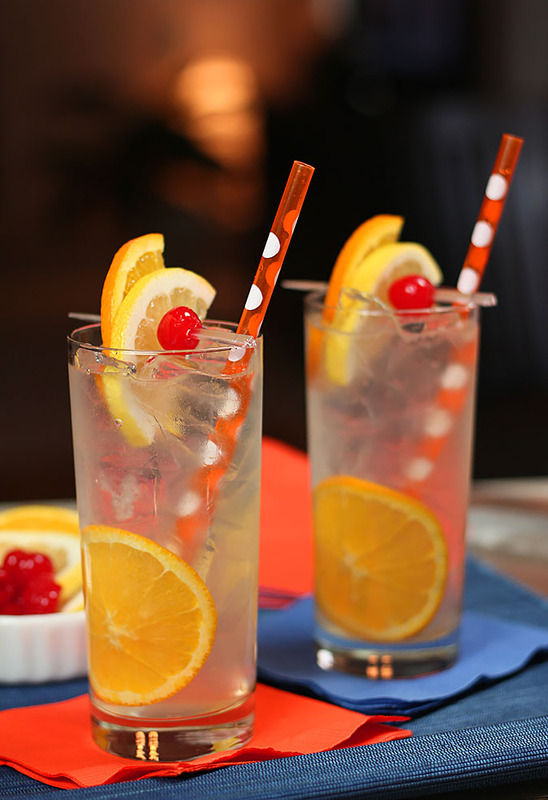 The Tom Collins Cocktail is one I love all year round; it’s perfect for a crowd and a great accompaniment to spicy foods served at parties. This time last year I was immersed in the opposite of what I am today; packing up and giving away and preparing to sell my home. You know what? I like this end SO much better. Still a lot of work but without the same deadlines and well, I’m in my home and not leaving it. There are no words. Except maybe Finally and Gratefully. I love this space. Yes, the yard is smaller and neighbors are closer but I’m OK with that and I’m already cultivating plans for what I’ll plant this summer. One word? Herbs. Especially lavender. It is one of the plants I left at my house that I just loved; why can’t I re-create Provence right here…in a sort of more minuscule way of course! What else is different? Well, this year the Denver Broncos did not lose a playoff game we hoped they would win, no, the boys in blue and orange did their job well and everyone in Denver, including moi, might be a bit excited about actually being IN the Super Bowl. GO Broncos! What is similar to this time last year is the lack of blog posts. Much like then, sandwiches, salads and soups are the meal plan if we’re lucky but we’ve certainly had more fast food than I care to acknowledge. Finding the time to craft a new cocktail is just not happening on a regular schedule yet because I have some work to do to get my new space ready for actually taking photos; you can see it’s still a bit of a mess. A trip to IKEA and a wall of shelves is going to have to happen to hold those boxes of cookbooks in the back corner but I’ve got internet setup and all my remotes synced…hey, I’m getting there! Still I had the urge last night for a favorite and wanted to make something I could serve during the game. The Tom Collins has a long history and is certainly worthy of being considered a classic. Rediscovering an ‘old fashioned’ cocktail is as much fun sometimes as making a new one and I just love this drink. I saw someone once refer to it as ‘the little black dress’ of cocktails and that’s a most fitting description; you can never go wrong when serving this simple, tasty and refreshing cocktail. Maybe part of the reason is that it’s easy and when I’m serving drinks to a crowd, easy is good. Made from gin, lemon juice, sugar and carbonated water; those are ingredients I always have on hand. The Tom Collins was first memorialized in writing in 1876 by “the father of American mixology” Jerry Thomas, as this “gin and sparkling lemonade” drink typically served in a Collins glass over ice. I’m having some friends over to watch the game…and or course to chat and drink and eat great food (like these fabulous pork tacos). I’m not much of a beer drinker so while I will have some on hand, this is one of two cocktails I’ll plan to serve to my guests (Next week I’m thinking a cocktail named ‘Omaha’ might have to be made!) Not pretentious or difficult to make, it’s a perfect cocktail to match with the wide array of foods served on game day…or any day for that matter! Though I would expect it is more often categorized as a cocktail for summer; I like it for a get together when a mix of appetizers will be served, especially knowing many of them have a tendency to be spicy…it’s a perfect compliment to hot wings, nachos and dips. Served in a tall glass with straws, it refreshing., easy and versatile…so don’t forget it when summer rolls around too! If you’re in need of a team to root for, well I invite you to try on the Broncos…and if you just need a cocktail to serve because you’re already a Broncos fan; try this one on. I added some orange juice from the cut orange, you know…all things orange and all this weekend, right? Maybe I should have renamed it the Peyton Collins! Fill your Collins glasses with ice and fill a cocktail shaker half full with ice. Add the gin, lemon juice, and simple syrup to the shaker and shake until cold. 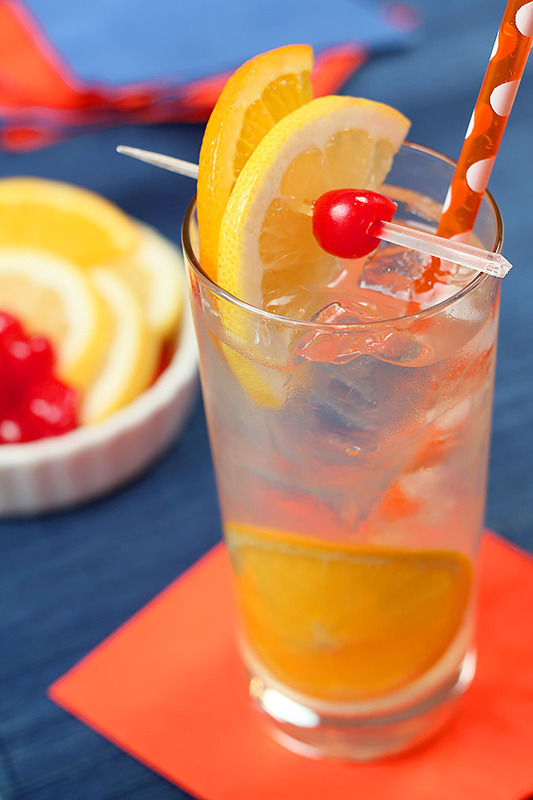 Top off the cocktail with club soda or seltzer, and garnish with lemon and/or orange wheels and a maraschino cherry. Though not at all typical, I decided to squeeze a bit of fresh orange juice into mine since I had sliced the orange for garnish. I can not deny...I liked it! « Slow Cooker Kalua Pork Tacos…and More Football Food and Drinks! I love Tom Collins! He and I knew each other well, way back in high school. Hate to admit it but I traveled with some older friends-one of whom was a bartender and his father owned the bar. He used to make me these all the time. Don’t think I’ve had one since. It is time to change that! That room is looking good! Here’s cheers to your new home and that fantastic photography room! I have one too, only it is also our guest room! I don’t know if I will be but I know for certain that my husband will be watching the Superbowl. His team didn’t make it in last weekend but he doesn’t care, he just loves watching American football. Your Tom Collins does look mighty refreshing and a classic cocktail like this requires no set season to sit back and enjoy one. I’m so happy that you are happy in your new home. I hope you become wonderful friends with some of your neighbours and though I can’t take photos as beautiful as you do to save my soul, I’m still a tad envious of your photography room. 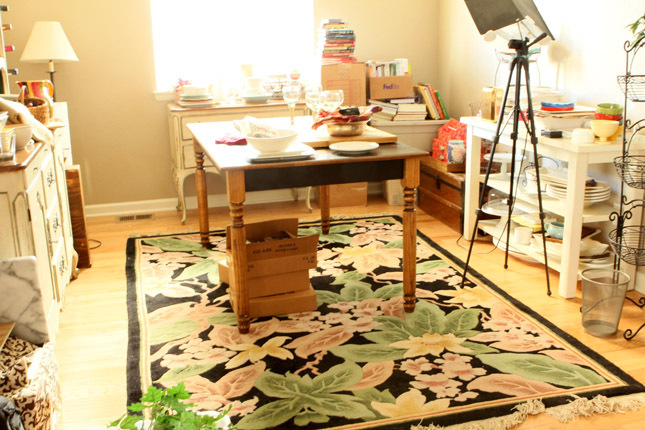 Have a lot of fun shopping for shelves for those cookbooks and finalizing the set-up to suit you perfectly. Then urge him to try these words on for size, ‘GO Broncos!’ See how easy that was? I just love Peyton Manning; a real class act. The room will be dedicated to photography and props but once I get it organized I’ll actually have spillover space for get togethers with friends…that table used to be in my kitchen so I still have the four chairs. Guess we could call it a multi purpose room but I just like the words photo studio so much more! I love your new photography space! Things are really starting to look like HOME– what a wonderful feeling it must be. Great drink and colors for the Broncos, I am looking forward to cheering them on. To get my boys out of the house on our way to school I now say, “Omaha, omaha, hike, let’s go!” Yup, we are Broncos fans! Did you know that one of the bets in Vegas is on how many times he will say it? Did you see him explain it during a press conference. Cracked me up! I love it too Holly now if I could just use it. I’m hoping IKEA tomorrow; I saw a unit that would literally fill the wall with shelves and that’s what I need. Fingers crossed! My mother’s favorite drink was a tom collins and your photos bring back great memories. I love the blue and orange…such a great Broncos fan you are. Sounds like a great recipe. I don’t think I’ve ever had a Tom Collins before. I’ll have to give the recipe a try. Your photo room is stunning and lots of light too. Oh you have to have one Jane…sometimes I just really enjoy a light and refreshing drink; especially with crowds. Something easy to make that tastes good and light enough to not encourage over-imbibing! Hope to see you down here soon! Oh that studio space looks exquisite! I can’t wait to come see it. Wait! the invite for the game day is still open? I can pack my bags in a moments notice .. now that I know what will be served! Go Broncos! First, I hope the moving and fixing and unpacking is close to getting done! Second, I LOVE the photos on this post. Third, HUGE classic cocktail fan. Sidecars are my drink of choice. I’ve posted about them before, but on other sites. LOVE them. SO, I’m all in for this TOm Collins recipe. I may mix one up this weekend! I’m SO happy for you finally being all done with this and in your new home. It’s was one hell of a year for you last year! If I had my choice, right now, of any cocktail in the world, it would be a Tom Collins. They’re so light and refreshing and my all time favorite. Made me chuckle…yes loving my new coordinates too! And yes, love this cocktail too; they do go down very easy don’t they? Hmm, I might need one right about now.